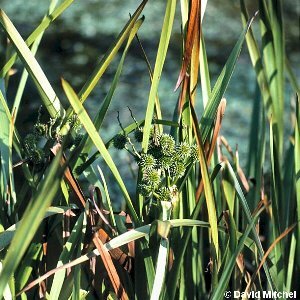 A very common plant of wet ditches, canals, fens, lake-sides, river-sides, ponds and similar wet habitats. 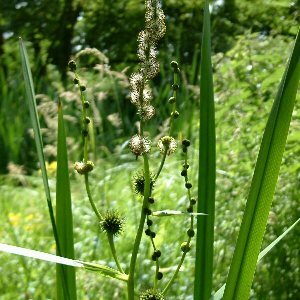 Easily recognised, with its tall shoots reaching four feet or so, long, narrow keeled leaves, and a stem which carries a branched inflorescence of globular heads of male and female flowers. 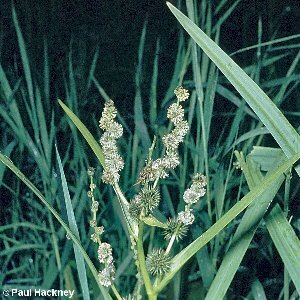 The female flowers develop into a bur-like structure which eventually breaks up into its separate fruits for dispersal. All names: Sparganium erectum L.; Sparganium ramosum Huds.